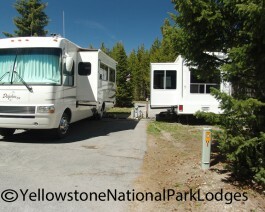 The Fishing Bridge Recreational Vehicle Park is located near the mouth of the Yellowstone River as it leaves Yellowstone Lake. The RV park is named after the Fishing Bridge, a wooden vehicle bridge that used to provide a great platform from which park visitors would fish for native Cutthroat trout. The Fishing Bridge RV Park provides approximately 250 sites designated for hard sided recreational vehicles only, because the RV park is located in bear habitat.